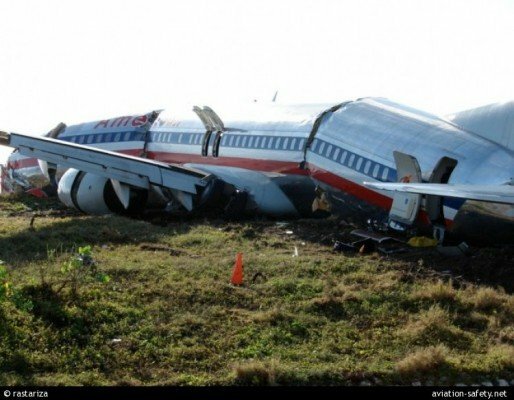 A December 2009 runway excursion accident at Kingston Airport, Jamaica, involving an American Airlines Boeing 737-800 was caused by the flight crew’s reduced situational awareness, according to a report released by the Jamaica CAA. American Airlines flight AA331 operated on a scheduled service from Washington, DC (DCA) to Kingston with an intermediate stop at Miami, FL (MIA). The flight left Miami at 20:52. There were 148 passengers and six crew members on board. The investigators state that before departure, the flight crew had formed the opinion that it would be safe to land on the wet runway 12 at Kingston as long as the tailwind did not exceed 15 knots. This was not verified during pre-flight and approach briefings. These omissions cost the flight crew awareness that landing on runway 12 in heavy rain with a 14 knot tailwind was marginal, and that there was a safer option to land on runway 30 using the RNAV (GPS) Rwy 30 approach. Deficiencies in the information provided to the flight crew regarding the runway condition could be said to have caused the flight crew to consider runway 12 braking action to be Wet/Good and led them to land on it, but the heavy rain during the approach and landing should have prompted the flight crew to consider the possibility that the braking action was worse than Wet/Good, as indeed turned out to be the case. After entering heavy rain, rhe aircraft touched down at 4,100 feet from the runway threshold. The flight crew did not apply maximum manual braking until the aircraft was more than 6,800 feet from the threshold. The plane skidded across a road and came to rest on a beach. The fuselage was cracked, the right engine broke off from the impact and the left main landing gear collapsed. All occupants survived the accident. JCAA concluded: “The investigation determined that the most probable cause of this accident was that the aircraft touched down 4,100 feet beyond the threshold, and could not be stopped on the remaining runway.